The number of English language learners in U.S. schools is projected to grow to twenty-five percent by 2025. Most teachers have English learners in their classrooms, from kindergarten through college. 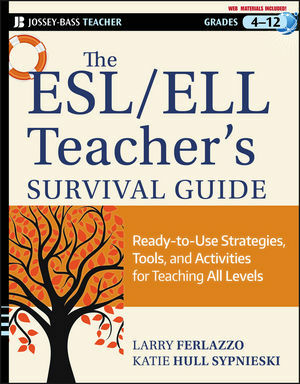 The ESL/ELL Teacher?s Survival Guide offers educators practical strategies for setting up an ESL-friendly classroom, motivating and interacting with students, communicating with parents of English learners, and navigating the challenges inherent in teaching ESL students. This hands-on resource will give all teachers at all levels the information they need to be effective ESL instructors. LARRY FERLAZZO is the author of "Larry Ferlazzo's Websites of the Day" (http://larryferlazzo.edublogs.org), the popular blog for teachers of English Language Learners and one of the most popular education blogs for all teachers. He teaches English at Luther Burbank High School in Sacramento, California. KATIE HULL SYPNIESKI teaches English at Luther Burbank High School in Sacramento, California, serves as a teaching consultant with the Area 3 Writing Project at University of California, Davis, and is a lead trainer for the WRITE Institute (Writing Reform Institute for Teaching Excellence).